How about on a whiteboard that you're planning to stand in front of while being interviewed by CNN? The LAPD is keeping tabs on drivers with automatic license-plate readers, and keeping all the information on citizens' movements (among other things) in a ginormous database that it searches with Palantir, a powerful data-mining application also used by the CIA. CNN interviewed a police captain about the system in April, and when that aired last month some people noticed that a board he was standing in front of showed computer login information. 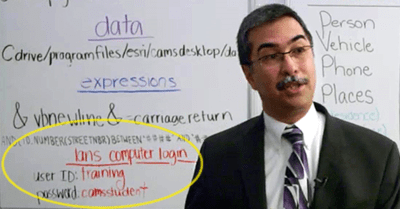 Granted, that appears to be a login for training purposes, and so it's not clear that the computers in question would be connected to the internet at all. Even if they're not, experts suggested that writing a user ID and password on the wall and then allowing a news organization to film you standing in front of it showed a certain lack of attention to basic cybersecurity principles.